Can last minute cruise deals REALLY save you money? That couldn’t possibly be right, my skeptical side thought. For glorious midnight buffets, chocolate fountains and baked Alaska presented in the darkened dining room with sparklers? NO WAY! There must be a catch. Cruises are typically a quite expensive and luxurious way to travel. 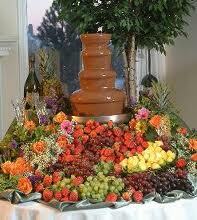 Exotic locales, extensive dining options, free room service, and did I mention the chocolate fountain? How is it possible the cruise line would let us on for a mere $35 a day? Having a fairly flexible schedule since we’ve been back in the states, we decided to see what we could find and take them up on their offer. Our goal – keep the daily cruise cost under $50 per person and go some places where we could get in some SCUBA diving as well. An inside stateroom was fine as we don’t typically spend much time in the room anyway (and after some of the hostels we’ve stayed in while traveling, ANYTHING would be a luxury!). We wanted to keep it cheap and keep it fun. On Halloween, we found it and booked it – a five-day cruise to the Western Caribbean for $149! Leaving on November 28th. Woo Hoo! Anything with Caribbean and cruise in it was fine with me. I expected we’d be on a third rate ship, but this one looks really nice! 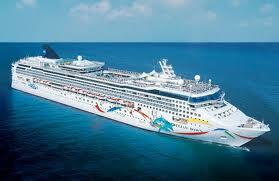 It’s the Norwegian Dawn and some of the amenties include 14 different dining options, 11 bars (wow! ), fun lounges, the fitness center and spa, casino, pools and more! We’ll be visiting Grand Cayman and Cozumel…can you say AWESOME diving? We booked it through Continental Airlines Cruises and after all port charges, taxes and processing fees, our total was $283 per person…just a little over our budget at $56 per day. We’re planning our own port excursions in Grand Cayman and Cozumel and meeting up onboard with a bunch we’ve already “met” through the Cruise Critic Roll Call for our sailing (gotta love the Internet!). They’ve provided us with some wonderful insider tips on the best way to make the most out of this cruise. Will keep you posted as we get closer to the sail date, but if you’ve ever wondered if those last minute cruise deals were for real, we can attest that YES, THEY ARE! We’re goin’ cruising on the 28th!